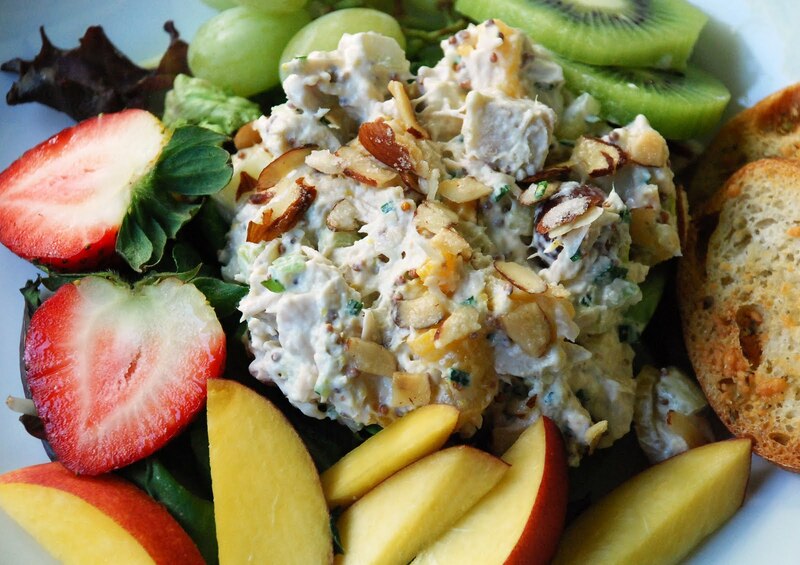 This Turkey salad is really light and has a great taste with the peaches and grapes in the mix. You can change it up by using chicken or tuna but I like the turkey. We just don’t eat enough turkey during the year except Thanksgiving. Why is that? I am on a campaign to eat more turkey…especially in the summer. Skinny food = Summer food. I prefer dark meat or a combination of the two because the salad has more flavor than when all white meat is used. Most people however will use white because of the lower calorie count. This recipe makes for a good summer dinner if it’s simply too hot to turn on the oven. Combine smoked turkey, grapes, peaches, green onions, and celery in bowl, and mix well. To serve, arrange 2 to 3 large leaves on each side of 6 dinner plates. Divide salad evenly and mound on lettuce. Garnish with kiwi, green grapes, nectarines, strawberries and a few thin slices of cheese crisps.